Describe the impact to commercial metal building enclosures of impending code changes, including IECC 2015, ASHRAE 90.1-2013 and ASHRAE 90.1-2016, which is in review. Explain the different obstacles and options for code compliance, including various insulation systems. Detail how the use of COMcheck, U.S. Department of Energy software, helps to maintain cost effectiveness of value-engineering metal building enclosures. Identify emerging trends in energy use reduction and overall impact on building design. Energy use in U.S. buildings, comprising nearly five million commercial buildings and 115 million residential households, represents 40 percent of U.S. energy consumption. Building energy codes are a critical component of the national effort to control the increasing impacts of building energy use. The Department of Energy supports and participates in the development of these codes, which have over the last several years become more stringent, more complicated and more highly enforced across the country. ASHRAE 90.1, the IECC and other building energy codes, standards, guidelines and rules are adopted as part of the larger body of building codes, and must be satisfied as a condition for approval to construct and occupy buildings. 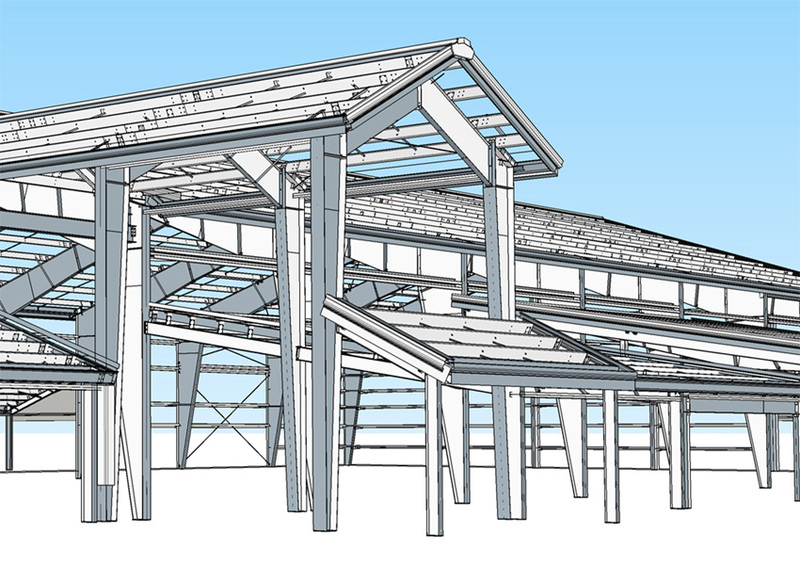 This article will discuss the impact of more stringent and closely regulated building energy standards and codes on the building process—specifically, as they affect the envelope for metal buildings. We will consider some of the challenges in adhering to the codes, and we also will identify solutions and compliance tools, products and resources that help projects meet code requirements and gain the associated energy benefits. Building with metal can offer many financial incentives for architects and owners, however understanding how to navigate the increasingly restrictive industry standards and requirements requires knowledge, patience and the right tools. For perspective, the primary energy consumption of the entire U.S. commercial and residential sectors in 2015 was estimated at 38 quads. Building energy codes and standards establish minimum efficiency requirements, assuring reductions in energy use and emissions over a building’s life cycle. These energy codes are a subset of broader building codes, which establish requirements and govern building construction. While building to code has its challenges, the positive result is buildings that provide greater comfort and are more cost-effective to operate long-term. When people speak in general about Building Energy Codes, they often are referring to American Society of Heating, Refrigerating and Air Conditioning Engineers (ASHRAE) 90.1, a standard, the International Energy Conservation Code (IECC), a code, or to state and locally adopted codes based on ASHRAE 90.1 and IECC. The IECC applies to both residential and commercial buildings; ASHRAE 90.1 applies to buildings except for low-rise residential buildings. The ASHRAE 90.1 standard is updated every three years. The IECC is generated two years after the ASHRAE 90.1 standard and incorporates new information and addenda from ASHRAE 90.1. The U.S. Department of Energy supports and participates in the development of both. Once the IECC or ASHRAE 90.1 is updated, states and other jurisdictions can decide whether to adopt the newer version. The energy code landscape in this country is complicated. States may adopt the IECC or ASHRAE 90.1 with or without amendments, or a state may implement its own energy code, as California and Washington do. In addition, cities and counties may adopt “stretch codes” that are more stringent than the statewide code. In the several “home rule” states, cities and counties may adopt their own codes, which may or may not be the same as the statewide code. As a result, the energy code landscape for a single state may be a patchwork of older and newer codes. It’s critically important to check with your local building official to understand which code to follow. Just because a state has adopted a new code does not mean that all counties and jurisdictions are enforcing it. The most recent versions of IECC and ASHRAE 90.1 are IECC 2015 and ASHRAE 90.1-2016, although these versions are not currently enforced or referenced uniformly across the U.S. As of October 2016, nine states have adopted IECC 2015 or ASHRAE 90.1-2013 or have an equivalent state energy code. Sixteen states are following IECC 2012, and another 18 are following IECC 2009. The trend for states has been to wait two code cycles before making a change; in other words, a state that is currently following the IECC 2009 is likely to adopt IECC 2015, rather than IECC 2012. This change to a significantly more stringent code can catch even seasoned building professionals off guard, as solutions relied on for years may no longer be adequate. Some states and/or jurisdictions accept either the IECC or ASHRAE 90.1 as the compliance path; however, it is up to the system designer to make this determination. In addition, if your state or jurisdiction allows you to follow either the IECC or ASHRAE 90.1, you must choose one or the other for all building elements; for example, you cannot “mix and match” by using ASHRAE 90.1 for the envelope and IECC for mechanical and lighting. In previous iterations, ASHRAE 90.1 has been a less stringent, more forgiving path for compliance, and in some cases, it can be more economical. It is worth noting that ASHRAE 90.1 distinguishes between heated buildings and semi-heated buildings, and allows lower insulation requirements for the latter. 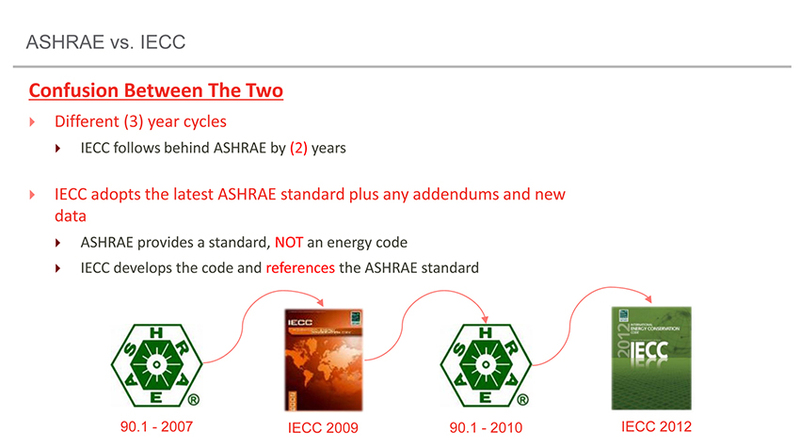 Many architects automatically spec IECC without realizing they can use ASHRAE 90.1 as a compliance path. Understanding which options are available for code compliance could potentially save projects both time and money. In many states, local jurisdictions can choose whether or not to adopt or enforce the state code. Implementation, compliance and enforcement vary with different jurisdictions which may lead to confusion as to which code is in effect. There is an unmet need for understanding new code requirements and language as well as appropriate construction techniques, materials and technologies. Enforcement issues are connected to both lack of training and lack of manpower (understaffing). Training is often unavailable or inadequate, despite its importance to all stakeholders, including designers, builders and those overseeing code compliance. The time-consuming nature of plan review and inspections isn’t always accounted for in department staffing. Some codes that were adopted some time ago are seeing more widespread enforcement. For example, the updated California Title 24, which technically went into effect in July of 2014, is now being more vigorously enforced. These challenges highlight the need to educate building professionals. If you haven’t yet seen the impact of newer, more stringent codes in your state, you likely will see them in the near future. Heat: energy stored in the movement of molecules. Conduction/Thermal Conductivity: flow of heat through solid bodies in physical contact, driven by collision of molecules, described by thermal conductivity, a fundamental property of solids. Convection: flow of heat resulting from currents in a fluid state by changes in density due to a temperature difference; also driven by molecule collisions, but is not contained within a crystalline structure. Reflectance: the amount of energy reflected by a body relative to the energy incumbent upon it; reflectivity is presented as a value between zero and one: zero means all energy is absorbed or transmitted; one means all is reflected. Blackbody: a theoretical object that absorbs all radiation energy incumbent upon it, turning it into heat at the same temperature (emissivity): - live. Reflectance + Emittance = Solar Reflectance Index (scale between 0 and 100; higher numbers represent higher reflectance; standard black SRI = 1; standard white SRI = 100). 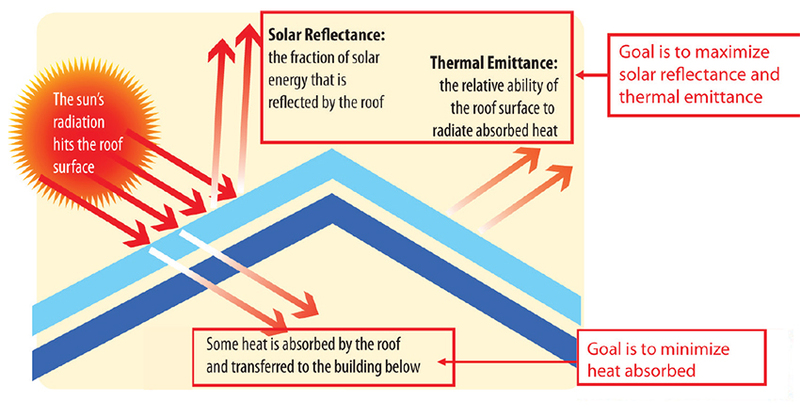 SHGC (Solar Heat Gain Coefficient): the ratio of solar energy absorbed and transmitted to the incident amount. VLT (Visual Light Transmittance): the ratio of light transmitted through a window to the incident amount. U-Value: the thermal conductance of a component or assembly, as expressed in BTU/ (hr.ft2.F). Shading Coefficient (older, not as common): the SHGC of a window compared to the SHGC of a clear 1/8-inch pane of glass.